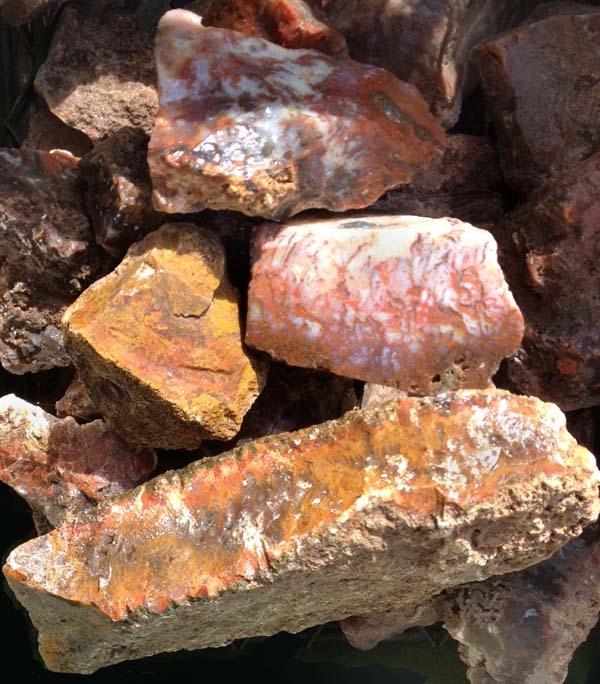 Sonoran Flame Agate was mined almost two decades ago and there hasn't been any on the market for years. We found this batch in our archives. Sonoran Flame Agate ranges from a clear base with red flames to a black base with flames in red, burnt-orange and mustard colors. Agate is a form of microcrystaline quartz. It is usually formed in nodules and has transparent, or translucent portions. As with all of the other species in the quartz family, agate takes a high polish with cerium oxide, but also takes a fine polish with tin oxide and diamond. Mohs hardness 6.5 to 7. 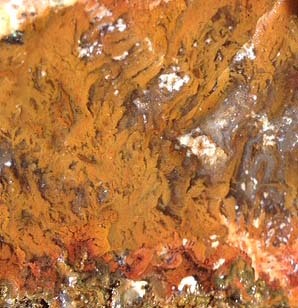 Close-up of Sonoran Flame Agate. Triangular shape measures approximately 3-3/4" x 3-1/2" x 1-1/2 to 1/2" thick. Measures approximately 4-1-2" x 3" x 1-7/8 to 1/2" thick. Measures approximately 4-1/2" x 2" x 3 to 1-3/4" thick. Measures approximately 3" x 3" x 2-1/4" at the thickest point. Measures approximately 3" x 3" x 3-1/4 to 1-3/4" thick. Two piece parcel of triangular shapes measure approximately 3-1/4" x 3-1/4" x 1-3/8" at the thickest point, and 3-1/4" x 2-1/2" x 1-1/2" at the thickest point. Two piece parcel. Triangular shape measures approximately 4-1/2" x 3" x 1-1/2" at the thickest point, and the other piece is 2-3/4" x 2" x 1-3/8" at the thickest point. Measures approximately 3-1/2" x 2" x 2-3/4 to 1" thick. Triangular shape measures approximately 3" x 2-1/4" x 1-1/2" thick at a peak. Measures approximately 3-1/2" x 2-1/2 to 1-1/2" x 1-3/4 to 1" thick. Measures approximately 3" x 3 to 2-1/4" x 1-1/2" thick. Measures approximately 4 to 3-1/2" x 4 to 1" x 3-1/4 to 1" thick. Measures approximately 7" x 4 to 2-1/2" x 5" thick.